If you’ve been following along with my Great British Baking Show Bake-Along, you’ll know we’ve come to the “Forgotten Bakes” Week in the group. Forgotten Bakes is the week that sparked the idea for the Bake-Along! I watched as the bakers made their “Bedfordshire Clangers” and they talked about how this was a Traditional Bedfordshire Hand Pie for agricultural or metal workers; I wanted to make a Clanger SO BAD. But I didn’t just want to make one; I wanted to part of a bake-off or group baking project and make Clangers. Boom, look where we are, right in the middle of my wish to participate in the Great British Baking Show, make clangers and fortuitously use up our leftover turkey. This week is winning for me, how about you? We’re getting near the end of our first bake-along. I think I’m planning to run another one, so it’s not TOO late to join us and participate in all of the fun (and none of the stress) of the Great British Baking Show Bake-Along. It’s an easy, fun way to make new foods, meet new friends and hone your baking, frosting, steaming, cooking and decorating skills. Plus we even have our own weekly Star(Bucks) Baker who wins a 10 dollar coffee card. It’s been so much fun, and I hope we keep having fun with new bakes in the new year, join us! In the show, they said that Clangers were a baked lunch hand pie sent with agricultural or metal workers. But a little research showed that perhaps they started life as a boiled dumpling and that the hand pie on the show was an invention of the 90s when a bakery made and sold them. I don’t know about that; a hand pie sounds a lot better than cold boiled dumpling for lunch out in the field. The Clangers on the Great British Baking Show were roughly 10 inches long and 2-3 inches wide. One end of the clanger gets filled with a savory filling, and the other end was a sweet pie-like filling. They were roughly 2/3 savory and 1/3 sweet with a little dough wall dividing them. For my Clangers I used leftover turkey, potatoes and a bit of gravy for the savory end. You can use ANY leftovers for the savory filling, plan on about 4-4 1/2cups of filling to fill the Clangers and make sure it’s not too wet. If you’re mixing up leftovers, I highly recommend warming them to pull them together and then let the mixture cool off before filling and wrapping. I gently heated the chopped potatoes and then add the gravy and leftover turkey and mixed them well. Then I tasted it, adjusted the seasonings and set it aside. Too hot of filling will start your hand pie dough melting before it gets a chance to bake. 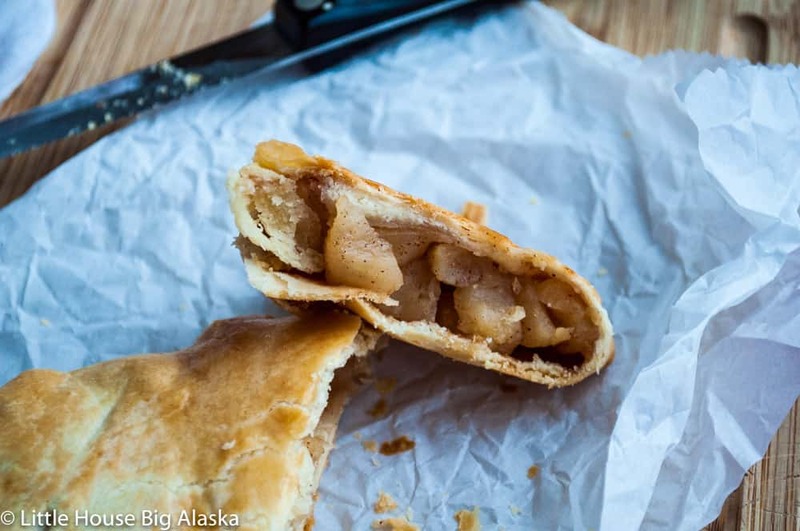 For the sweet end of the hand pie, I used four apples on the edge of being too ripe to make a bit of an apple pie filling. You’re going to need roughly 2 1/2 cups of filling for the sweet end. Each hand pie will get a nice full 1/3 cup or so of sweet filling. 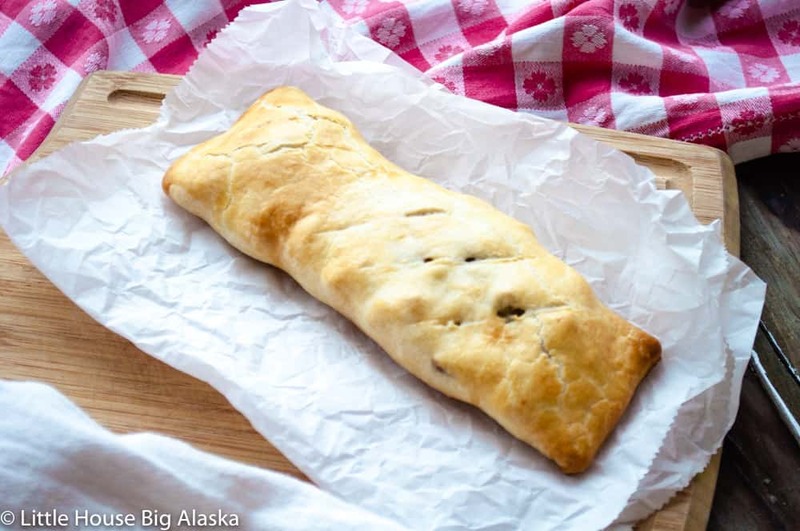 And don’t worry this recipe includes the Hand Pie Dough recipe as well. Flaky crispy and perfect for rolling hand pies. It’s not sturdy enough to pack to the field but it will make it to your plate! Enjoy! 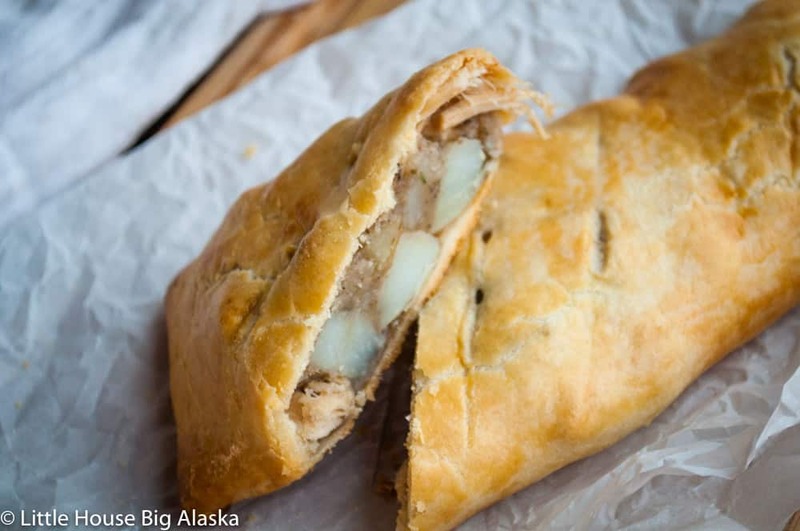 Clangers are a traditional Bedfordshire Hand Pie. 2/3 savory, 1/3 sweet with a flaky crust. Featured on the Great British Baking Show, perfect for leftovers. Amazing recipe! I’ve never heard of Clangers. 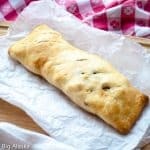 The idea of savory and sweet in the same pastry is brilliant! I know! Wish I could take credit for it but alas I can’t! Fixed that thanks! 375˚ But they can be baked at 350 OR 400 if you adjust the baking time accordingly. CAN THEY BE MADE THE DAY BEFORE? I don’t know. I’ve never done it that way.